Penny Hershaw of Toronto, ON for submitting this photograph for us to use. Hello everyone and welcome to another issue of Whispers, the newsletter of the Dereila Nature Inn where we celebrate nature and photography. We'd like to thank you for subscribing and hope you'll enjoy the features we have for you this month. Which group of insects has the largest number of different species? 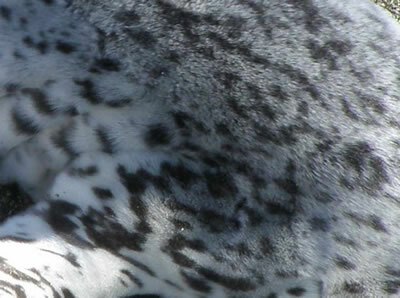 Once again we wonder if you can determine what this cropped close-up photograph is. You'll find the answer at the end of the newsletter. It's been a busy month at the Inn and we have lots of new features to tell you about. Click on the image to go straight to the page. Our latest interactive crossword features flowers that have been chosen as flower of the month over the past few years. We have two new destinations for you to visit virtually: Yoho National Park and Kootenay National Park, both in the Canadian Rockies. Our latest At-A-Glance Guide features an interesting assortment of colourful dragonflies and damselflies. Here's a variety of colourful berries to savour. 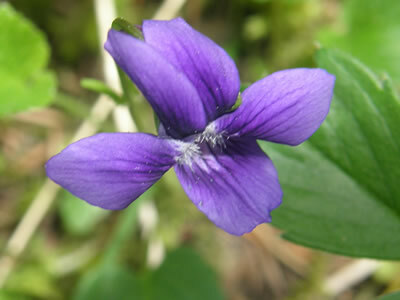 Become familiar with some of the different shapes of flowers and the clusters in which they sometimes grow. The wildflowers on this page are hardy ones that can thrive in disturbed spots such as beside a highway or road. See how effective and easy it is to reflect natural light. Find the latest additions on the news page. We invite you to submit photographs of nature to this section. Submitted by Bear Wagoner of Bradwenton, FL. 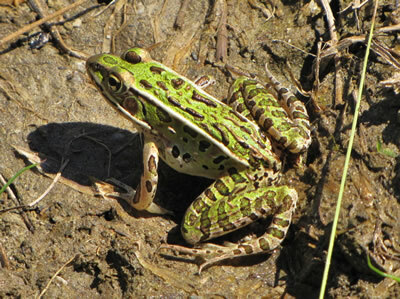 Northern Leapard Frog, Rana pipiens. 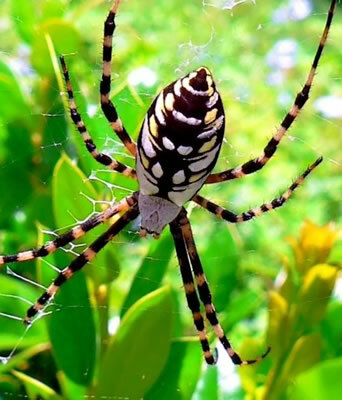 an hour northwest of Toronto by Tony D.
This Florida spider was sent in by Marilyn Flanagan of Florida. Many, many thanks for sending in your wonderful photographs! Bug - Bee Fly; Wildflower - Mullein; Bird - Bewick's Wren. 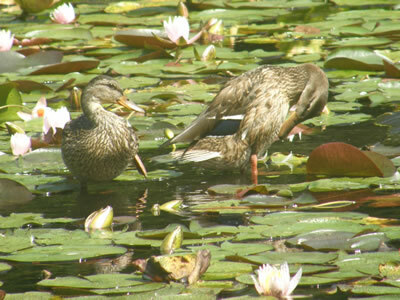 This month we wander over to a lily pond. have an ability to actually stand on the lily pads! 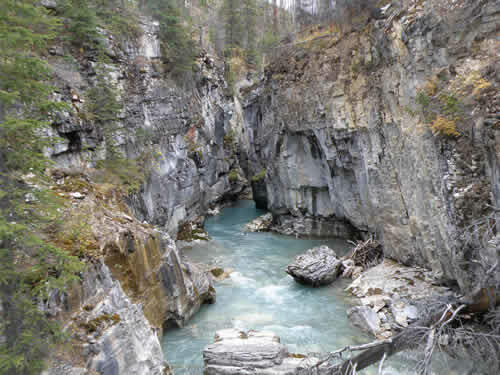 The Tokumm Creek has carved its way through dolomite bedrock to create Marble Canyon in British Columbia's Kootenay National Park. The rock is not true marble but has been polished by the waters and has a marble-like finish. Forest fires swept through the area in 2003 causing much damage to the bridges which cross the canyon, the interpretive trails and the forest. Everything has since been rebuilt, the forest is recovering and the canyon is now open to visitors. 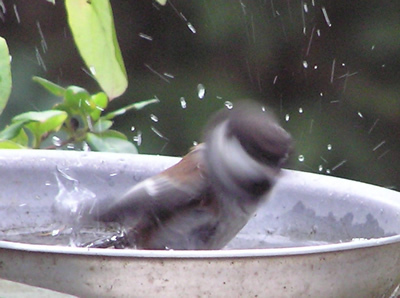 This chickadee seems to be having a lot of fun but the picture needs a funny caption or two. Do you have any suggestions? We've given you a couple of ideas. Number one: "This always gives me such a headache." Number two: "I hope there's a towel handy somewhere!" If this photo inspires you, please send us an e-mail. 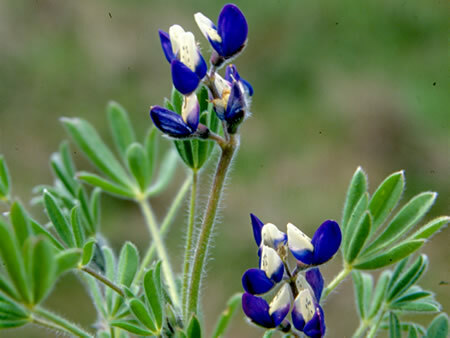 The Small-flowered Lupine, Lupinus polycarpus, gets its name from the Latin lupus meaning "wolf," a reference to the inaccurate belief that lupines devour soil of its nutrients. Poly means "many" and carpus comes from the Greek karpos, meaning "fruit" resulting in many-fruited or fruitful. 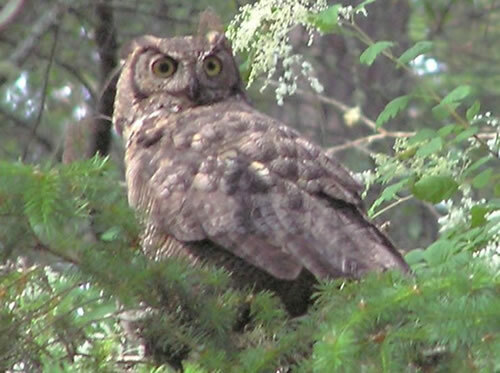 Each evening Tom would stand in his garden and hoot like an owl. One night he heard an owl call back. For a month he would call and receive hoots back. When at the mall one day, his wife told her neighbour about Tom and his strange obsession with owl hooting and how he spends his evenings doing this. "That's so strange," her friend said. "My husband does the exact same thing." "Don't know about having two owls around, be we have two nuts close by." 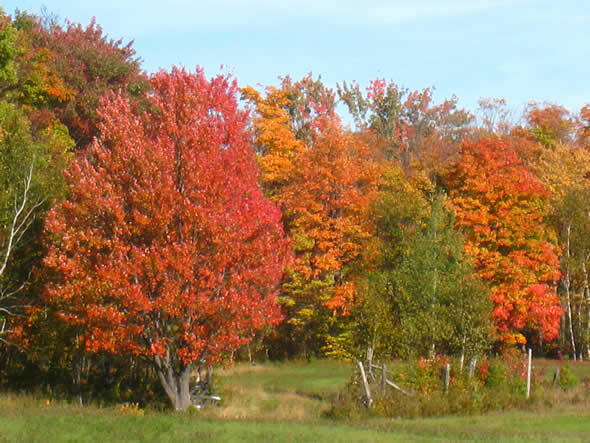 Many thanks to everyone who has helped us by supplying images to help complete our page on State and Provincial Trees. 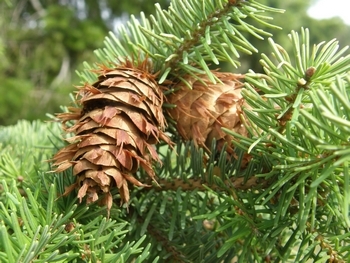 New Brunswick - Balsam Fir, Abies balsamea. For those of you who live in areas with snow and frost remember to keep your water dishes clear of ice and snow and full of fresh water. 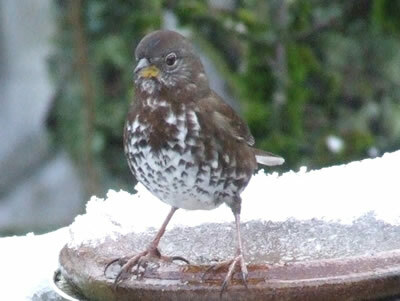 The birds need the water as snow is no substitute. During dry periods mosses can become limp-looking. When taking photos it's always best if you can get the moss looking nice and fresh. Many mosses will quickly respond to a little water so if you have a small spray container, take it with you on your nature walks. If not, a few drops from a drinking bottle will revive some mosses in a few seconds. 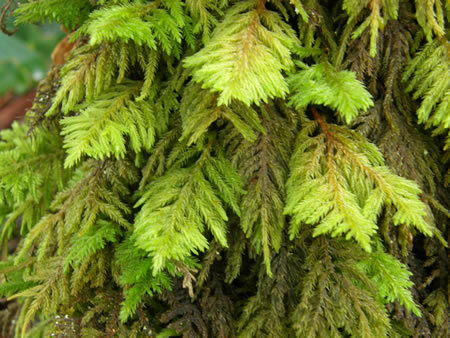 This is Plume Moss and it readily reacts to a little bit of water. Try spraying water on other subjects such as flowers or pebbles on the beach and see for yourself the difference it can make. of food for the endangered Oregon Silverspot Butterfly larvae? 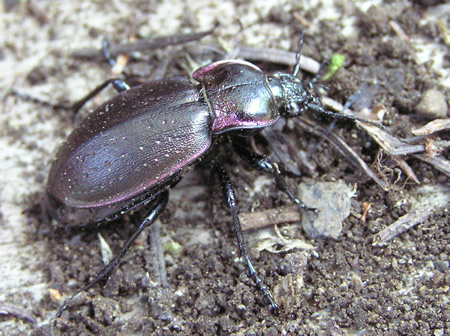 There are more species of beetle than any other group of organisms. North America alone. This is the European Ground Beetle, Carabus nemoralis. Here we reveal the answer to our mystery photo. 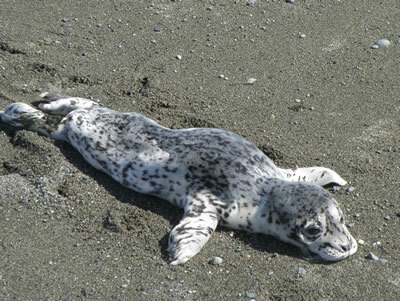 It's a young seal pup crawling down to the sea while waiting for its mother to return. We hope you've enjoyed this month's newsletter. Please spread the word about our project by passing on our website information to friends and other nature lovers. You can also forward this newsletter by clicking on the "forward e-mail" link at the bottom of this newsletter. Your ideas and suggestions are always welcome. Send us an e-mail! 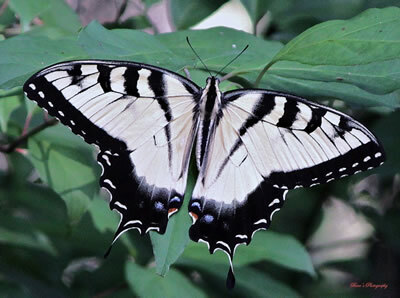 Until next time, best wishes from your friends at the Dereila Nature Inn - the Cyber Nature Centre for Nature Lovers. Watch for the next issue of Whispers in your inbox during the first week of December.